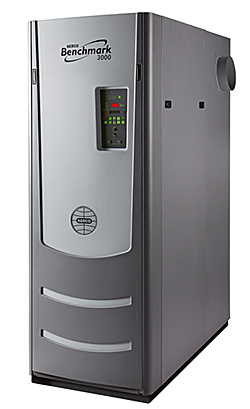 The Benchmark 3000 boiler features 15:1 turndown with operating efficiency of 93.5 percent, stainless steel construction, and delivers <30ppm NOx at all firing levels. An Oxygen Level monitoring system displays levels directly on the boiler's C-More Control Package in real time. Measures 78 inches high by 28 inches wide by 56 inches deep.